About the Outfit: Sunglasses+Maxi skirt: Cotton On// Stripe Shirt: H&M// Vest: Guess// Watch: Gucci (Vintage)// Flats: Michael Kors// Purse: Tory Burch// Nail Color: Essie "Meet me at Sunset"
Oh! I heart yr vtg Gucci watch!!!! yeah, the outfit is interesting in a good way :) I really like the shoes and watch. nice combination overall! That maxi skirt does look really comfortable! I'm loving the look of your Michael Kors + Essie nails! Makes me want Summer to come quicker for me! I love that you styled a jean vest with this outfit, it looks great! Pau me encanta este look! funciona todo a la perfección, yo no he tomado ningunas fotos para esta semana, entiendo cuando la vida se cruza jaja pero que bien que nos enseñaste este outfit tan lindo, besos! Great Look! I can't beleive you were going to give that vest away..it's super cute and works so well with your outfit! Great outfit! You look amazing :) I like your bag...it is PERFECT with your whole look. This looks fantastic and I like you how styled the denim vest! Que guapa!! Me encanta el look, y sobretodo me encanta el chaleco :) Todo lo que sea mezclilla me fascina!! You look so good in these pictures, I love your skirt and the combination with the lovely blouse and vest and I adore your accessories, you look nice! Your blog is lovely and I'm a new follower! Hope you'll like my blog and follow back! You look really cute, love the outfit. I have been wanting a denim vest for a while now. Pau de verdad gran outfit!!! te ves muy hermosa, y los chalecos son geniales!!!!!! why don't come and see mine! and if you like, we colud follow each other? Pau que lindo look, yo también ando usando chalecos por montón son super lindos. wow! you are so pretty! love the outfit! Pau...I love the denim vest and the striped top and maxi skirts are two of my favorites right now. Thanks for reminding me about the crop top trend, I totally forgot. haha, I think I bought a couple and they're still hanging in my closet. Never wore them :) hehe Next summer. You look really pretty and I know what you mean, everything seems so busy when weddings roll around. p.s. Your Tory Burch purse is really fun! Great look! 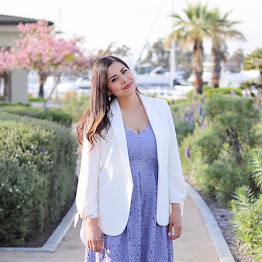 I found your blog through Cess @ The Outfit Diaries. Its great to find more style bloggers from spanish-speaking cultures, as I have been searching for diversity in the style blog world. Nice outfit! Love the combination! I love your flats! I'm a huge Michael Kors fan!